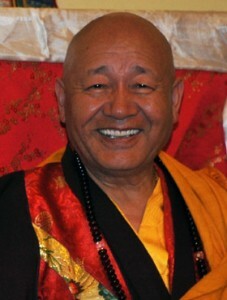 Lama Yeshe Losal is Abbot of Kagyu Samye Ling Monastery and Tibetan Centre, Director of the internationally acclaimed Holy Island Project and the Retreat and Meditation Master for a host of students from around the world. He is also a much loved and respected teacher whose wisdom, compassion, warmth and humour reveal him as a living example of the Buddha’s teaching. However, this was not always the case. As he says himself, “If the teachings can benefit me, they can benefit anyone!” Self deprecating though that remark may be, it is nonetheless true to say that Lama Yeshe Losal was not always the revered holy man he is now. Such is his modesty and openness of heart that he quite happily shares his past history as an example of how the base metal of one’s impure character can be transformed into gold by strenuously applying the alchemy of Buddhist wisdom and skilful means. His Holiness the 16th Karmapa himself often described Lama Yeshe Losal as living proof of how Buddha Dharma can effect positive change in someone’s life. For while many Tibetan monks in exile gave up their robes in foreign lands, Lama Yeshe Losal did the opposite by leaving Tibet as a lay person, then becoming immersed in Buddhism and taking full ordination in the West. Not having his own monastery in Tibet to consider, Lama Yeshe Losal is now able to devote himself to the preservation and propagation of Buddhism in the West through his Monastery of Kagyu Samye Ling in Scotland and its many associated Centres around the world. With his profound insight, acquired through many years of meditation in solitary retreat, and his personal experience of a broad spectrum of people from both the East and West, Lama Yeshe Losal is able to demystify and illuminate the Buddha’s teachings in a simple yet inspiring way. His humour and direct, down to earth approach crosses continents and cultures enabling him to give both personal advice and meditation instruction that goes straight to the heart. It is these unique qualities that make him a Lama of and for our time.